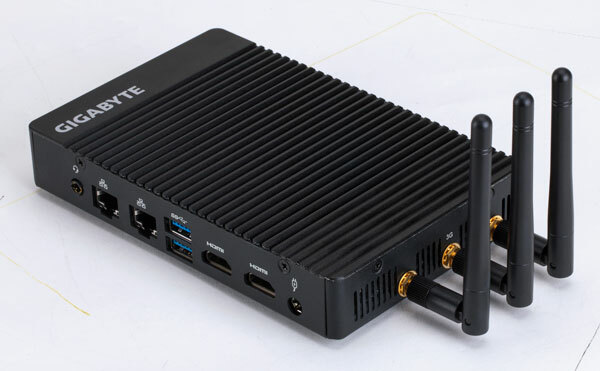 GIGABYTE, a veteran provider of mini-PC form factor devices, is set to launch a new line of products specifically designed for IoT applications. These new devices—built on Intel's newest 7th Generation Processors for mobile computing—are entirely fanless thanks to very low power consumption, and have very small footprints—making them ideal for connected applications that also require remote management and maintenance. The EKi3A-7100 and EKi3M-7100 are new commercial solutions in GIGABYTE's IoT product line. These robust IoT gateway systems are designed to support a versatile number of applications running in a variety of scenarios. With the new Intel CPUs, these devices have improved integrated graphics enabling easy video playback at 4K UHD, and their small size—less than one half liter in volume—enables installation in a wide range of places. Digital signage, point-of-sale, kiosks and automotive applications such as onboard policing devices, are among the situations suitable for the EKi3A-7100 and EKi3M-7100. In addition, the new IoT devices are outfitted with a mini-PCIe port and SIM card compatibility enabling systems to be brought online through 3G connectivity without Wi-Fi. This capability allows both cloud connectivity in remote situations and also supports security systems—making the EKi3A-7100 and EKi3M-7100 ideal for use in banking and financial applications where multiple and dispersed devices can be managed and monitored from a central location. Both the EKi3A-7100 and EKi3M-7100 feature a robust metal body heat sink which encompasses a very efficient cooling system. The low-profile devices fit easily in the palm of a hand, have no moving parts and are very cost-effective to operate. GIGABYTE's BRIX mini-PCs have been deployed in a number of industries and used in a variety of applications. The BSi5HA-6300 with Intel vPro technology allows remote management of mini-PC systems, enabling organizations to monitor and manage applications through encrypted wireless communications which is an industry standard for security protocols. The BRIX product line is designed to protect data, prevent mishaps and solve issues—and the BSi5HA-6300 can serve as a bridge device to GIGABYTE's IoT solutions. GIGABYTE provides partners with superior support, warranties and service through its business portal website. Warranty and longevity continue to be strong for both IoT and BRIX product lines and buyers can take advantage of programs that offer bonuses, promotions, and rebates. GIGABYTE also works with Intel to provide GIGABYTE rewards and Intel Technology Provider Points for qualifying products. GIGABYTE will be exhibiting its IoT and BRIX products at the Digital Signage Expo 2017 in Las Vegas, March 29 and 30. See demos at booth #136 of GIGABYTE's IoT and BRIX product lines and hear how partners, including Instorescreen, are utilizing IoT solutions for 4K digital signage solutions. Intel, the Intel Logo, Intel Inside, Intel Core, and Core Inside are trademarks or registered trademarks of Intel Corporation in the U.S. and/or other countries. * Models may vary based on local distribution. This article was originally published at ChannelPro Network on 03/20/2017. It was added to IoTplaybook or last modified on 02/12/2019.